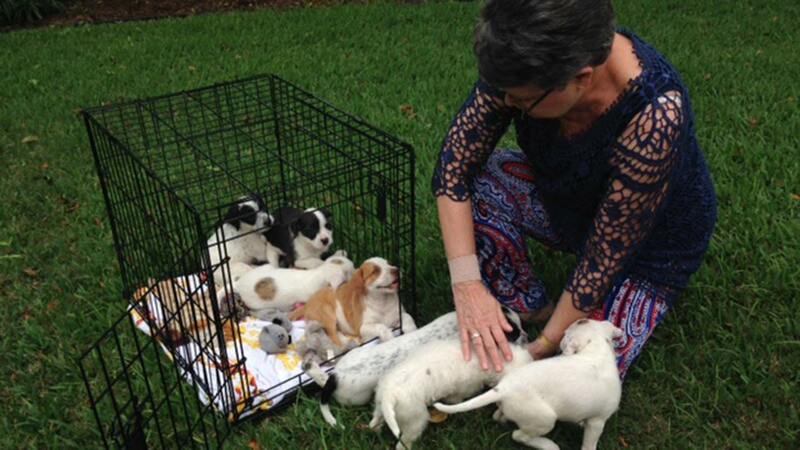 HOUSTON -- A rescue group is trying to find homes for seven puppies, discovered after someone abandoned them outside a Fort Bend County home overnight. Ann McIntire says she woke up to the sound of puppies barking outside her Greatwood home around 3am Wednesday. She stepped outside to investigate and discovered the dogs placed in a wooden crate, near the edge of her driveway. "I thought, 'Oh my gosh!!!! There's puppies in there, and there's one out.' I panicked, I went inside and I said 'Bill, I don't know what to do,'" McIntire said. Her husband helped bring them into the backyard. "Hmmmmm... what are we gonna do with seven puppies?" Bill McIntire said. They let them out and gave them food and water. They have no idea who ditched the dogs and suspect their house were chosen only because they are the first house on their street and it meant a quick and easy escape. A neighbor posted on Facebook for help from any rescue groups. "Every day we get phone calls for situations like this," said Carma Trimble, a volunteer with AARF Houston. "Adopt a Rescued Friend" Houston is non-profit through which volunteers foster animals in the hope of eventually finding them permanent homes. It's taken these dogs in despite their limited resources. "I don't know a rescue organization in this city or this state that's not already over populated," said Trimble. Trimble and the McIntires hope folks will realize the responsibility of pet ownership and the commitment it requires, but they're thankful at least that whoever ditched these pups left them somewhere where they could eventually find safety and shelter. The puppies will be vetted and fostered, for now. Once old enough they will be available for adoption. AARF says it is always need of volunteers who can foster animals. Too often people who are well-intentioned don't realize the commitment necessary and they sometimes then back out, returning the animals, creating a burden on other volunteers. You can log onto www.aarfhouston.org to find out more.